If you’re anything like me, while you love having your favorite planner decoration supplies spread out as you go, it’s nice to be able to round everything up. I’ve recently been shopping online for the perfect affordable storage solution for all my supplies. After thinking a small piece of furniture or rolling cart would take up too much space and money, I settled on a much more affordable solution. 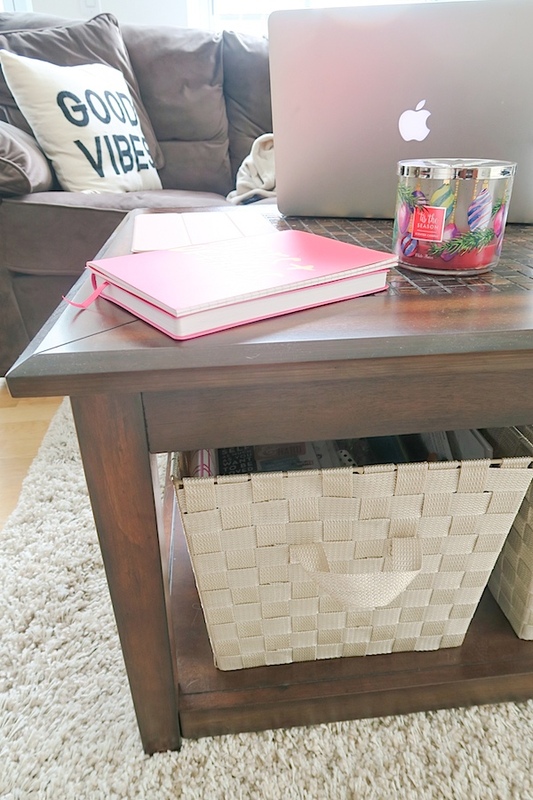 Today, I’m sharing my planner supplies storage for under $20. And I mean this is how I store all of my planner supplies for less than $20. 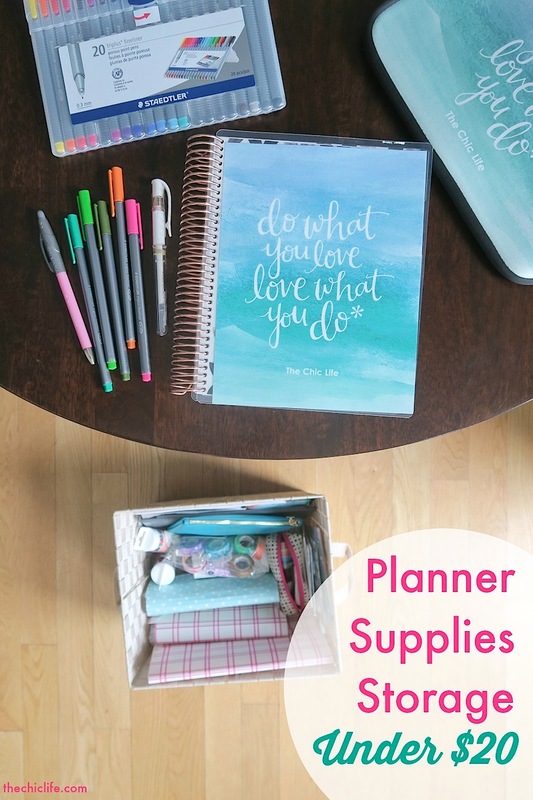 And while I personally use an Erin Condren LifePlanner, this should work for planner decoration supplies for any planner: Erin Condren, Happy Planner, Passion Planner, kikki.K, Filofax, and more! Note: This post contains affiliate links. If you make a purchase using one of these links, I’ll make a small commission at no charge to you. While I normally recommend products that I personally own, I thought it may be helpful for me to link the items I was considering purchasing. If you have any questions, please contact me. I’d love to hear from you! When looking for the right storage solution, you want to consider how you plan. I like being able to easily see my supplies all together. It’s out of sight, out of mind for me. If I don’t see something, I may forget I have it. And while storage solutions are great, I end up pulling out what I want to use during a planning session and spreading it out on a flat surface. So, I realized I need a place to store my planner decorations, pens, stickers, washi tape, etc. where I can easily see everything, take things out, and put them back. I tried the take-one-thing-out-at-a-time approach, but it didn’t quite work for me. While researching options, I considered: a craft bag, a rolling cart, a small storage cart. Craft stores and Amazon had some cute craft bags. You know the kind with multiple pockets and tiny zippered compartments all over the place? While I loved the idea of being able to tuck this in the closet to get it out of the way, I didn’t like not being able to see everything at once. It seemed too easy for me to lose track of things in all of those pockets. I’ve seen some really cute rolling carts full of planner supplies on Instagram and Pinterest. You know – the ones styled with perfectly placed, color-coordinated sticky notes, notepads, pens, and other stationery. While I admire these beautifully filled carts, I know myself enough to know I don’t have the patience to maintain something like this. As for cart options, prices of these varied quite a bit, from $30-100. There were nice options at Amazon, The Container Store, and Target. But, I didn’t love the idea of my supplies being so visible. I prefer my supplies behind closed doors. In case you’re curious, this is the cart I was thinking of getting – Storage Cart – White – Room Essentials (Target). I may still get one to organize a closet. In my research, I found some storage carts that had doors on the front. This would fit my requirements to keep my supplies behind closed doors. But, these options are also much more expensive. Most are priced around $100-150 were pretty good. But these could take up an unnecessary amount of space in addition to money. I loved the combination of door storage with shelves on this item – Utility Organizer, White ASIN=B01MUD7LRR (however, I’d personally be hesitant to order this since it has 0 reviews – you may want to wait until someone else has tested this out for you). So what did I end up with? It’s pretty simple really – a basket. You can get this basket, or something similar, for under $20 with a coupon at Michael’s. I found this one for $19.99 I believe. I’ve had it for awhile now but for storing other things. I only recently repurposed it. But the price tag is long gone. I also think they were on sale 50% off, so I scored mine for $10. It was either 40 or 50% off. Not too shabby, eh? I don’t have the item number, but this Rectangle Strapping Basket by Ashland looks like the one I have (but in brown). The dimensions (15″ L x 12 5/8″ W x 10″ H) match the one I have. Tip: Be sure to check Michael’s web site before you go shopping so you can scope out the coupon options. You can easily look them up for your local store. I also use several things from the Target dollar section for storing stickers and pens. I have one large accordion folder binder for large sheet Etsy stickers. And two smaller binders for the small Etsy (and other) stickers. I use the small case to hold my main favorite pens, a thin washi tape set dispenser, and scissors. The multi-color Staedtler Triplus Fineliner Pens (recommended here) came with their own, easy-to-store case. That’s $16 for my supplies storage. So glad I didn’t get that $180 piece of furniture now. And while I could easily outgrow this basket, I’m currently working to keep my amount of planner supplies down. Normally, I’m a collect-all-the-things kind of girl. But I’ve recently been experimenting with minimalism, and that’s inspired me to try to keep my things to a minimum. If you have more supplies, you could try using multiple baskets. But a dedicated cart may be more useful for you. My tables are now clear. When I’m ready to plan, I grab my supply basket, take out what I need, plan/decorate, put everything back, and tuck the basket neatly away. I’m really loving this storage solution so far! How do you store your planner supplies? What’s working really well for you?